While markets await details on the next round of quantitative easing (QE) — whether refreshed bond buying from the Fed or sovereign debt buying from the European Central Bank (ECB) — it’s important to ask, What can we expect from further heroic attempts to reflate the OECD economies? The 2009 and 2010 QE programs from the Fed, and the 2011 operations from the ECB, were intended as shock treatment to hopefully set economies on a more typical, post-recession, recovery pathway. Here in 2012, QE was supposed to be well behind us. Instead, parts of Southern Europe are in outright depression, the United Kingdom is in double-dip recession, and the US is sweltering through its weakest “recovery” since the Great Depression. Recently-released data from all these regions now confirm that previous QE, at best, merely bought time against even more grueling outcomes. Spain’s unemployment, for example, has just hit a new post-Franco high of 24.6%, and the forecast for this crucially important EU economy remains negative. Recently revised US figures on GDP show that the post-2009 recovery was even weaker than previously estimated, with the first year post-crisis crisis clocking in at 2.5% vs. the expected 3.3%. Plodding, slow growth in the aftermath of a global financial crisis is a recipe for stagnation. The inability of the US economy to work off its surplus of labor appears to have finally stirred OECD policymakers into action. This is, of course, a great and humbling disappointment to the recoverists, who keep mistaking various economic oscillations around a bottom for the start of a typical post-war, V-shaped recovery. Housing, autos, jobs, Internet IPOs, state tax revenues, and train traffic have all been called upon by optimists to sound the clarion call for a broad economic recovery. Yet the US economy still is only able to produce sector-specific or selected regional strength that never adds up to quite enough to restore national growth. When we look at national GDP, at 1.5% in the most recent quarter, it is not clear the US economy has enough forward speed to statistically distinguish between slow growth and no growth. Large states like California, for example, are already seeing the return of declining state revenues. Meanwhile, national poverty — one of the best measures of aggregate economic health — continues to soar. There is no doubt that any new round of QE — especially a double shot from both the Fed and the ECB — will have psychological impact. For Europe, QE would once again allay systemic risk. And for the US, QE will surely find its way to the stock market; which is not an insignificant outcome as America increasingly relies on the stock market to produce retirement income. However, the question arises, What series of radical measures policy makers will turn to after the next round of QE wears off? Before we answer that question, let’s review the poor economic conditions leading to the next (and final) round of QE. House prices in the US have done an excellent job of adjusting downward over the past 5 years to reflect the stagnation in US wages, the overhang of private debt, structural unemployment, and the rising cost of energy. But there has been a recent media celebration of sorts over this story, as it now appears that housing is bottoming. To be sure, certain housing markets like Miami and Las Vegas continue to recover from completely bombed-out levels. Additionally, construction of new homes, especially multi-family homes, is off the bottom. For now. The problem is that housing is a result, not a cause, of economic expansion. And unless housing is to work in tandem with wage and job growth, housing alone cannot power the US economy. Did the US not already learn that lesson already over the past decade? 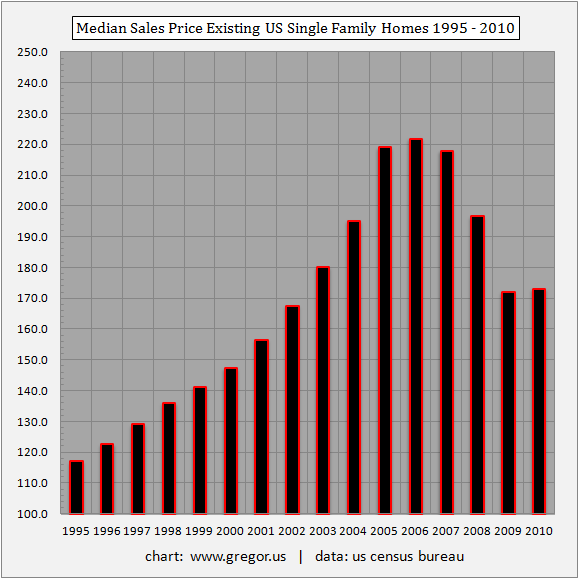 The unsustainable peak in 2006, when single-family homes reached a median sales price of $222,000, marked a near-doubling of price over the ten-year period from 1995. But as we now understand, not only were wages (in real terms) not rising during this period, but a new bull market in commodities was getting underway, robbing Americans of discretionary income. The result is that house prices were able to keep up with the loss of purchasing power until slightly past mid-decade. Then they collapsed. Worse, the phase transition in rising energy prices kept going (and continues through today), which had an outsized impact because the topography of US housing, largely dependent on roads and highways, is quite exposed to transportation costs. Second, there is the lack of wage growth and the problem of structural unemployment. The surplus of labor prevents the broad, marginal pressure needed to force national house prices upward. Third, the constraint of oil prices will not ease. This means that urban real estate may do well on a relative basis, but the majority of US homes will continue to adjust downward to reflect the permanent repricing of oil (and hence gasoline). Finally, the notion that real estate prices have bottomed with mortgage rates near all-time lows seems a very risky call. Is it more prudent to presume that a new advance in national real estate prices will be carried on the back of rates going even lower — or higher? Which is it? The view that real estate has bottomed appears to assert that no matter where interest rates go from here, real estate is going higher. That is the mark of hope and belief; not analysis. It seems very unlikely only five years into such enormous, structural shifts in the US economy that the repricing process is over in housing. At minimum, I expect the median price of single-family existing homes to revert to the 2000 level of $147,000, with the strong possibility of an overshoot to the $125,000 level. This process will take several more years. The United States economy has lost the momentum it appeared to be building earlier this year, as the latest government statistics showed that it expanded by a mere 1.5 percent annual rate in the second quarter. This is precisely the kind of news flow that the business press can expect to report for years to come. Sure, the stock market may advance from points of low valuation. Certain regions of the country, especially those tied to exports, may thrive for a while. But nationally, a long secular contraction is now in place that will combine stagnant wages, contraction in government payrolls, flat tax revenues, and the shift to a cultural preference for much lower consumption. In addition to the fact that young people will not buy cars, will not buy houses, and in general will not secure high-paying jobs (if they can secure jobs at all), the nature of work in the US has entered a degrading period. Low wages, part-time work, poor benefits, and higher health-care costs all serve to further squeeze consumption. 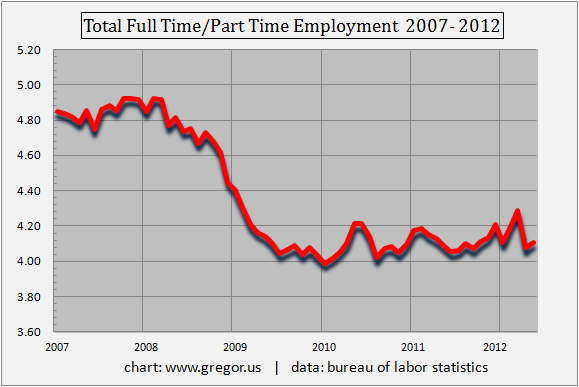 Let’s take a look at the structural shift from full-time to part-time work in the US. At an inflection point in a normal recovery, US workers would quickly be hired back to full-time jobs. But a full-time job with benefits is a cost that US corporations no longer wish to bear. This is partly why US corporate earnings and their accumulation of cash has been so robust. Sited in the US but acquiring labor abroad, US corporations are having their finest hour as they sell products to non-OECD markets that benefit from wave after wave of stimulus from the OECD, while the economy and labor force in their home countries languish. Here in the US, we have effectively stripped out an entire tranche of the full-time US workforce, with no plausible scenario currently in place for adding it back. America used to have nearly five full-time jobs for every part-time job. Now we have four. Meanwhile, Washington, characterized by professional normalcy bias, has finally started figure this out. More importantly, this is why the economy will veer continually towards recession absent some form of stimulus in the years to come. While the jobs market is surely the primary reason why QE 3 will be attempted, it’s also the reason why more radical measures are likely thereafter, as opposed to QE 4. Many of the prognostications for QE’s impact on the labor market, especially from the Fed and Fed-connected economists, simply never came true. That will become even clearer after QE 3 fails. After leveling off in late 2011 and early 2012, the number of persons taking Food Stamps (Supplemental Nutrition Assistance Program, or SNAP) in the US is starting to push higher again. Given that food prices are set to make their next move higher as well, it’s reasonable to expect SNAP participation to reflect that pressure on household budgets. The annual cost of the program, which rose in the three years 2009-2011 from $50 billion to $64 billion and then to $71 billion, is quickly becoming a significant budget item. For comparison, should SNAP program costs reach $75 billion this current fiscal year, this amount is almost exactly equal to the most recent Department of Transportation Budget, at $74 billion. The ranks of America’s poor are on track to climb to levels unseen in nearly half a century, erasing gains from the war on poverty in the 1960s amid a weak economy and a fraying government safety net. Census figures for 2011 will be released this fall in the critical weeks ahead of the November elections. The Associated Press surveyed more than a dozen economists, think tanks and academics, both nonpartisan and those with known liberal or conservative leanings, and found a broad consensus: The official poverty rate will rise from 15.1 percent in 2010, climbing as high as 15.7 percent. Several predicted a more modest gain, but even a 0.1 percentage point increase would put poverty at the highest level since 1965. Poverty is spreading at record levels across many groups, from underemployed workers and suburban families to the poorest poor. More discouraged workers are giving up on the job market, leaving them vulnerable as unemployment aid begins to run out. QE is a poor transmission mechanism for creating jobs. While there has certainly been a recovery of sorts in US jobs since the deep lows of 2009, in which total employment has risen from 139 million to 142 million jobs, this has been insufficient to keep up with population growth. Accordingly, if the US job market cannot aggregate the number of new workers into its system, then it cannot work off the structural labor surplus. Indeed, the rather narrow targets that QE aims for are exactly the reason why the US and the OECD are fated to try more unconventional solutions once the next round of QE fails. In Part II: What Radical Measures to Expect in the Post-QE Era, we forecast that policies to revive stagnant Western economies (and the US, in particular) will swing sharply away from central banks towards elective bodies. Such programs will involve various forms of debt jubilee and massive infrastructure programs. More unconventional is that some of these programs may be initiated using new forms of government scrip, equity participation, or other methods that allow the government to “spend” without incurring new debt. Contrary to the deflationist view, which holds that governments will eventually turn to austerity, the examples of such failed efforts in the United Kingdom (which has entered a double dip recession) suggest that austerity will be nothing more than a brief, economic dalliance of Western policy makers — recall that the Works Progress Administration (WPA) of the 1930’s was considered radical in its time. We should expect no less this time around, as governments decide to pursue WPA 2.0.